W2 Mate is the easiest and fastest W2 and 1099 Forms printing software. W2 Mate prepares forms W2, 1099, W3 and 1096. Supports printing SSA-Approved laser substitutes for W2 Form Copy A and W3 on regular white paper, which eliminates the need for buying W2 and W3 forms. 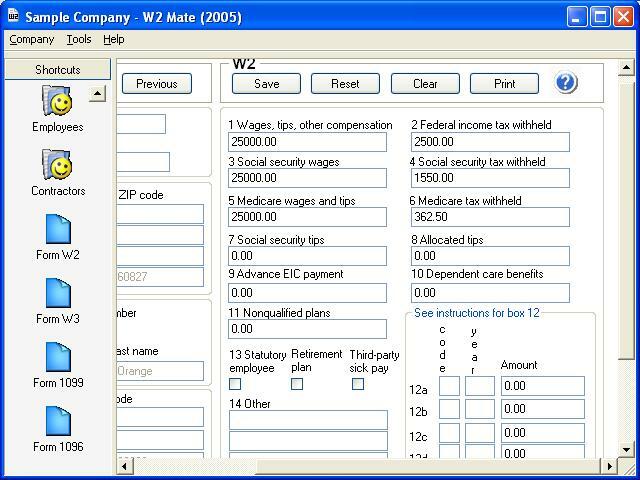 W2 Mate supports unlimited number of companies, forms, employees and recipients. The software prints on both white paper and on Red-Ink Laser forms. California Real Estate Forms, FormFiller, Printer, Viewer, Approved forms. Nevada Real Estate Forms, FormFiller, Printer, Viewer, Approved forms. Qweas is providing links to W2 Forms - as a courtesy, and makes no representations regarding W2 Forms or any other applications or any information related thereto. Any questions, complaints or claims regarding this application W2 Forms - must be directed to the appropriate software vendor. You may click the publisher link of W2 Forms on the top of this page to get more details about the vendor.